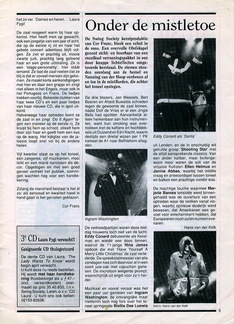 Memories singing in the famous Jazz Club Langs De Lijn with My Big Foot Quartet. This is my original hand made creative poster. It was a fun time a time of emense possibilities. I met the young musicians in hilversum. Here we are. Please Look & Enjoy.!! It still feels like yesterday to me. Magic Moments. The Barbizon Palace Hotel was Fabulous. The Audience.! Wow!! With The American Song Book Swing Society. With Mr Ingram Washington Marjorie Barns Just to mention a few. What a Beautiful Building on the outside. Wait until you see the inside. 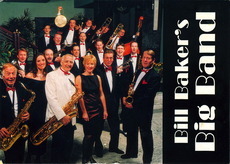 The Bill Bakers Big Band. Glenn Miller BBC. Are some of my most vibrant memories. I was in the musical Josephine when Mr Wim Zweekhorst Called me Up & invited me to come & sing with their Big Band. Hallelujah & Amazing Grace. Growing up listening to all thoes live recordings of Miss Sarah Vaughn Miss Ella Fitzgerald Miss Nina Simone to name a few. I would always visualise Myself standing there singing with a big Orchestra Behind me. I Love every performance. Singing with BBBB Glenn Miller was a dream come true for me. I now understood Miss Sarah Vaughn & Miss Mahalia Felt. What Delight What Power. The Energy Is Simply Electrifyingly Amazing.! A Musical Marraige made in Heaven. Same again Anytime. 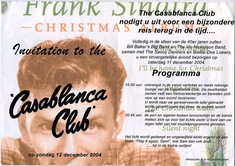 Singing At The Cassablanca Club together with the Savoy Dancers. Wow you need to see them move. I can still feel the atmosphere truly "This Joint is Jumping". Thank You Mr Wim Zweekhorst. We'll Meet Again.! 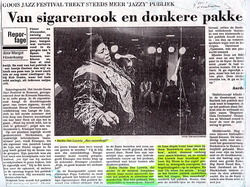 I also have the Great Honour of Singing in Jazz Festivals when the Blessings falls down. Memories. I love singing in Jazz festivals. To recall just a few. Singing in The jazz Festival Den Bosch. With The Four Ladies Of Swing & The Lex Jasper Trio. With Jump 'N' Jive In the Memory of Miss Rosa King. Wow What a Lady. Bless Her Soul. Here I Am On the Poster for the First Gospel Festival Zo In Amsterdam. I auditioned & got the role to be on the Poster It was then that i revealed to them that I Sing Gospel. A Hallelujah Moment. The rest as they Story Is History. I Sang Twice in this Amazing Festival to date 04/05. I Am In Heaven. What a wonderful atmosphere. I feel Honoured & Blessed to have been a part of this wonderful festival. What a Blessing to see so many Beautiful little Souls also Attending. This has really brought back a lot of emotions. I hope that you have enjoyed reading my memories as much as i have have enjoyed living remembering & sharing them. As well as my passionate love for the Theatre. I Am also Blessed to perform as a Guest Solo Artist. I Love to Sing Warm Spiritual Joyful Upbeat Heart Warming Ballards & Inspirational Songs. Sharing & Spreading the Feeling of Love Peace Joy Soul & Freedom making the connection from within. My Repetoire is my lifes journey which reflect the different stages, experiences & challenges through out my life. There have been many challenges Ups & many downs in my life. Many times when i just wanted to lay me down to rest. So I Say Thank you for the Music the Joy it brings me. This is Spiritual food for My soul. Comfort Food For Me. 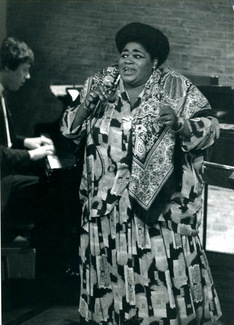 Musical Numbers such as "Ole Man River" "Fish Got To Swim"
Classical Spirituals such as "Deep River" "A Balm In Gilead"
Jazz Standards such as "Wonderful World" "Aint Misbehavin"
Gospel & Spirituals Such as "Precious Lord" "A Closer Walk With Thee" "Were You There"
Enjoying so many Genres of music my Repetoire is open to discussion. Being known as The Accapella Queen my performances are both Accapella(Acoustic). As well as performing with Live Musician(s) Freelance who love their instruments(s) as much as i do. With A passion. I Sing Often With Pianio. Pianist The Rainbow Piano Man I Call Him. Mr Feico De Leeuw. When I Perform together with him I Am In Heaven. He Is So so Talented. On Stage We are Connected. Love You Mr Piano Man. I Am Blessed to work together with you. Working also with one or more instruments in the form of a Duo Trio Quartet is always open to discussion. Also If & when required I perform with backing music for small occassions. Life is always heavenly for me when musicians are already a part of your deal. I will come & join your occassion as A Guest Solo Artist. Details of Performances are discussed thoroughly & made to meet each request. I Believe the Charm of the Songs & My Interpretation of them compliment gatherings such as Theatre, Festivals Ex..Gospel, Jazz, Exhibitions, Churches, Presentations, Christenings, Spiritual Events , Dinner Shows ,Private Functions & Openings, Spiritual Events, Weddings & Funerals. Happy Birthday To You. Plus Other positive events that your heart desires are negoitable. Be it Large Medium or Small Spiritual & Intimate Uplifting & inspirational A Heart Warming Joyful Blessing. Spread The Love. Pass It On.